Welcome! 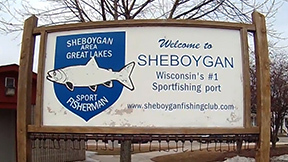 The Sheboygan Fishing Guy website was created by two friends who grew up fishing on the shore of Lake Michigan in the City of Sheboygan, Wisconsin. Website host, David Newton. Fishing host, Shannon Durfee. As teenage boys growing up in Sheboygan, catching your first big salmon or trout from Lake Michigan was like a local right of passage into manhood! As grown men now, those memories and experiences are in our blood, drawing us back to Lake Michigan to fish, to walk or to drive the lakeshore. Lake Michigan is like our National Park, our natural wilderness. 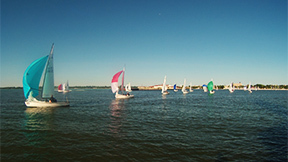 It's a place to get away from the hustle and bustle of the city, to see the colorful beauty and immense power of nature. If we're to long gone, there is a longing in our hearts to see it again! 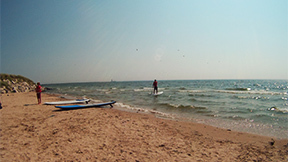 Over the years, Sheboygan has been becoming one of the best summer family vacation destinations on Lake Michigan! More and more families are coming to catch their own trophy fish, or to relax and enjoy the many activities on Sheboygan's, Lake Michigan shore. Because Shannon and I spend a lot of our time fishing on Sheboygan's piers, we've had the wonderful opportunity to meet many of the people from all over the world who have come to visit our hometown! We are always asked a lot of the same questions. What are you fishing for? What kind of fish are here? What kind of baits and lures do you use? Where can you fish? Where's a good place to eat or stay? What's there to do in Sheboygan? We both thought it would be nice if we had a website where we could tell people to go, to answer a lot of the questions that we were being asked. 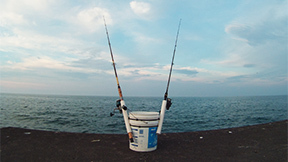 A website to help families plan their fishing trip or vacation to Sheboygan! Being on shoestring budgets and with neither of us having any formal training in building websites, it was a fun idea but that's all it was! Being fishermen though, we were optimistic and didn't want to give up on our idea. So, after many hours of research over several months, I was very excited to find exactly what we were looking for! A low cost, Do-it-yourself, all-in-one, E-Commerce and Small Business website building company called Site Build It. They teach us everything about building our website with easy to follow videos. I then researched and bought, a low cost Drift HD 720 action camera for our pictures and videos, and a low cost subscription to Adobe Photoshop Creative Cloud to render the pictures and videos. That's how the Sheboygan Fishing Guy website was born. Two friends who love to fish in Sheboygan, meeting visitors to our hometown and wanting to share with them the best that our city has to offer! As our website grows, we hope it will answer some of the questions that you may have about our hometown, so that you can plan the best fishing trip or vacation while you are here! Shannon and I thank you for your visit to our website, and we hope to see you out catching a trophy fish!